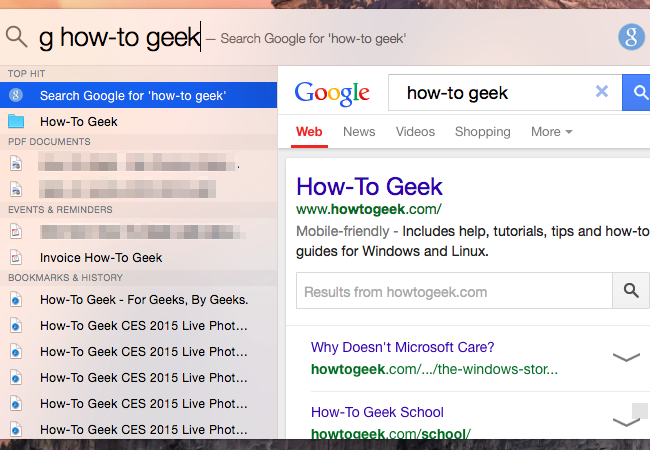 Mac OS X 10.10 Yosemite brought a revamped Spotlight search interface. But it’s still limited. Flashlight smashes those limits, adding a plug-in system to Spotlight. This app isn’t just a collection of bonus features for Spotlight. It’s an entire, reverse-engineered plug-in system. You can install plug-ins other people have made or create your own. In spite of Mac OS X 10.10‘s much-touted extension features, there’s no way for applications to add new features to the system-wide Spotlight search interface. You can search your computer, do conversions, and see Bing search results. But what if you want to search Google, view the weather, create reminders, quickly send messages and emails, and do other things? This would be possible with an extensions system, and Flashlight is an open-source application that adds that extension system. To enable Flashlight, download the Flashlight application from its website. Unzip it and drag it to your Applications folder. Double-click the Flashlight icon to run it — you may need to bypass your security settings if you have GateKeeper enabled, as this application is currently unsigned. 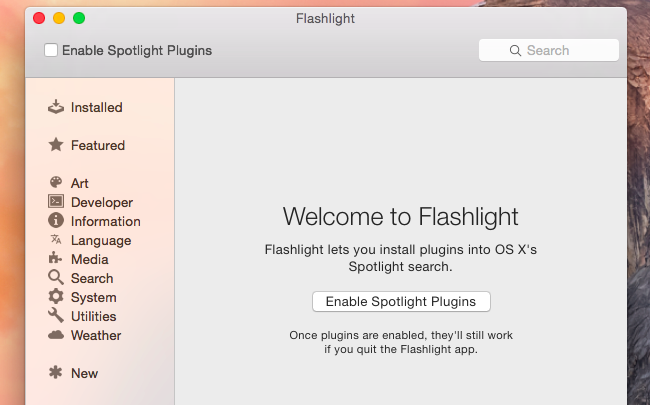 Launch the Flashlight app and click the “Enable Spotlight Plugins” checkbox or button to activate Flashlight and its additional Spotlight plugins. You can close Flashlight after this if you want — it doesn’t have to remain running in the background. After you toggle this option, the Flashlight app just becomes an interface for installing Spotlight plugins. The Installed section also provides a quick look at your installed plugins and how to use them. After installing a plugin, just press Command+Space and type the appropriate shortcut to use it. You don’t have to restart anything — it’ll work immediately. Search Google: The Google plug-in lets you search Google directory from Spotlight, rather than just depending on Bing. Install it and type something like “g your search” or “google your search” into Spotlight to search the web. Spotlight normally requires you use Bing, so Flashlight is a life saver here if you depend on Google. 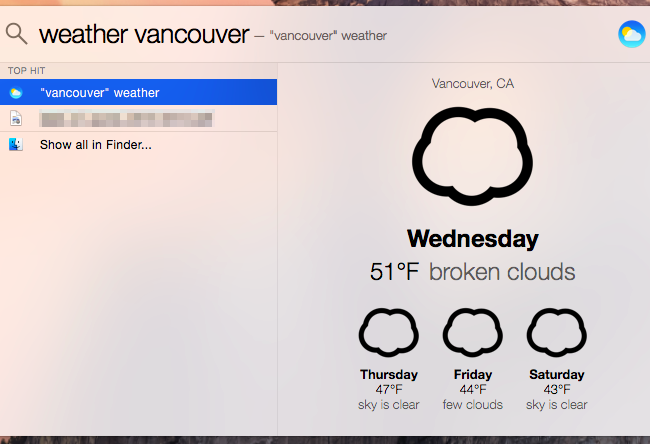 View Weather: Install this plug-in to quickly view the weather in a location. Just pull up spotlight and type “weather” followed by a city’s name to see the weather forecast for that location. Create Reminders: Use Spotlight to create reminders with the Remind Me plugin. 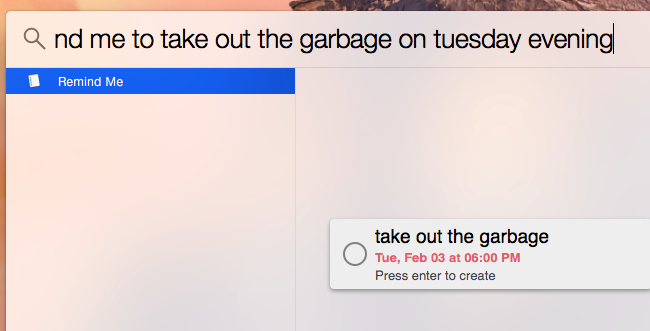 Type something like “remind me to take out the garbage on tuesday evening” and press Enter to quickly create a reminder in Apple’s Reminders app. 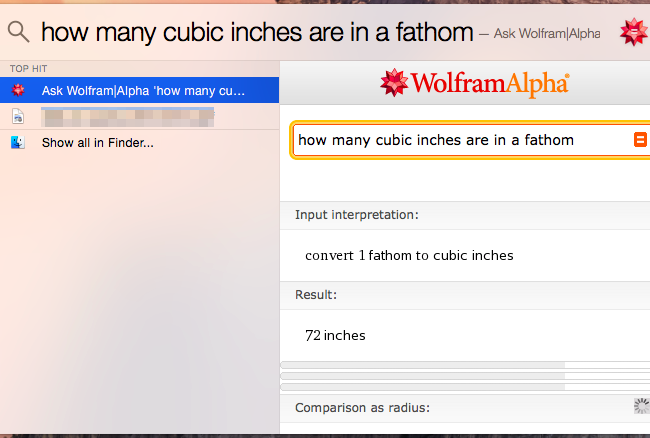 Ask Wolfram Alpha: Type “wa” followed by a search to ask Wolfram Alpha something. As we’ve covered before, Wolfram Alpha can answer a lot of surprising questions that you might otherwise need some in-depth research or math calculations to answer! 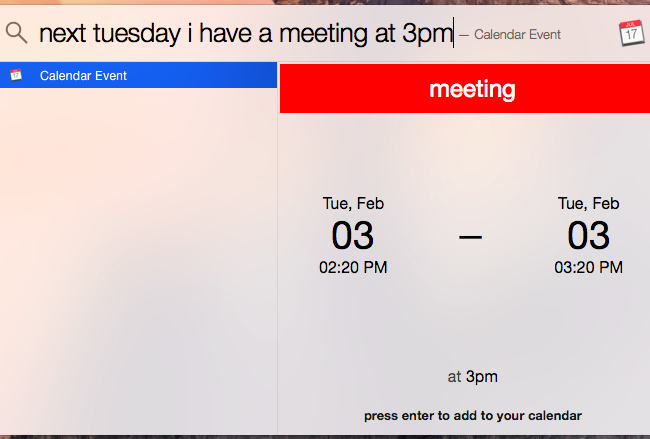 Create Calendar Events: The Calendar plug-in allows you to quickly create calendar events, so you can tell spotlight something like “next tuesday I have a meeting at 3pm” and it will create the calendar event for you. Send iMessages: The iMessage plug-in can send messages via Apple’s iMessage service. That makes it possible to send SMS messages right from Spotlight. 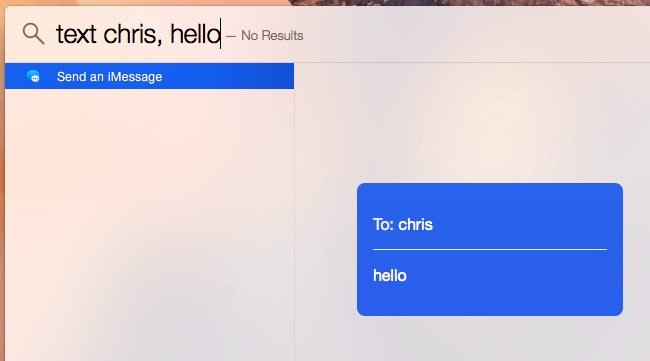 Just type something like “text chris, hello” after installing it. Send Emails: The Email plug-in allows you to quickly send emails from Spotlight. 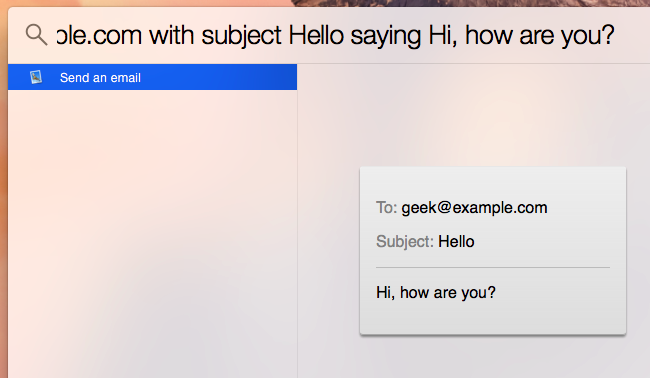 For example, you could type something like “send an email to geek@example.com with subject Hello saying Hi, how are you?” The preview automatically shows how your email will look as you continue to type. Translate Words: The Instranslator plug-in lets you quickly translate words from one language to another type “translate word to language” to get a quick translation without visiting your browser. Run Terminal Commands: The Terminal plug-in allows you to quickly run terminal commands from Spotlight. 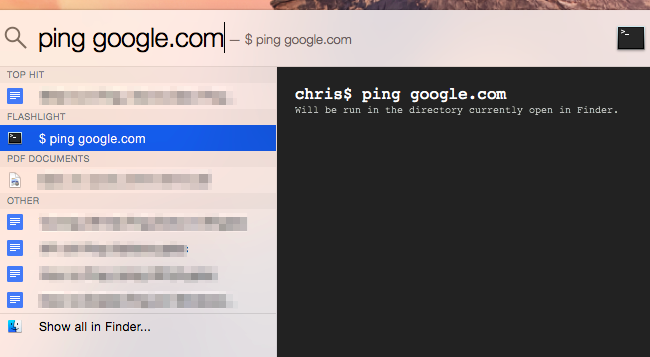 For example, enter “ping google.com” and then press Enter to quickly start pinging google.com without opening a terminal first — it’ll open the terminal for you. If you have a directory open in the finder, the command will be run in that directory. You can also create your own plug-ins — for example, you might quickly want to search another website (like How-To Geek!) from the Spotlight search window. You can either follow the Creating a Plugin instructions on Flashlight’s website or use an Automator workflow. Click the New Plugin menu in the Flashlight app to get started. 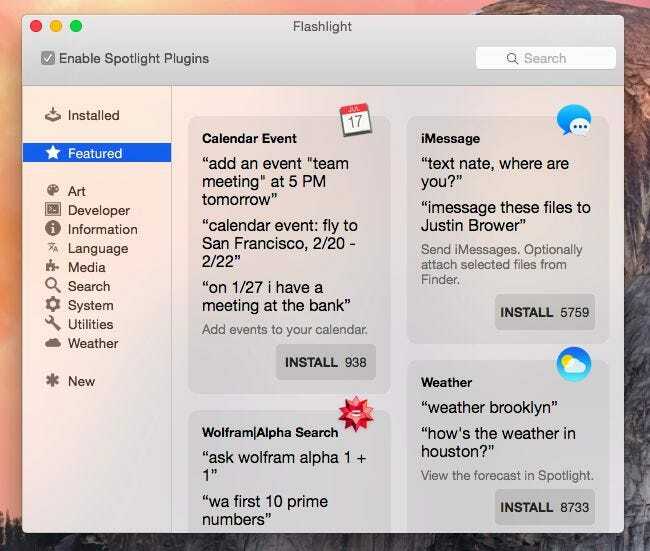 Apple should really add an extension system for Spotlight to Mac OS X itself, and hopefully they will in a future version. For now, Flashlight is the best way to extend Spotlight and make it useful for more than just launching applications.